The famous hot dog stand on George Washington University's campus is home to the one..the only.. Manouch. Everyone knows his name because of his delicious late night hot dog stand. His stand, located on the corner of H and 21st St., is only open from 9pm-3am on Thursday, Friday, and Saturday nights to appeal to the wandering drunk students with munchies. There is always a line of 20 people or more outside the stand throughout the night, but it moves quickly. Manouch is a comic attraction himself because he talks to students offering them dating advice and inquiring about their lives. 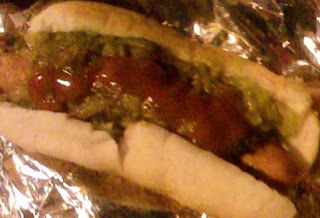 Of course, his hot dogs are the best around which also accounts for the lengthy line. He has a famous secret recipe, the GW Sauce, which I would best describe as a spicy relish. He pours on the sauce in addition to any other topping you prefer onto your 3 dollar hot dog, making the experience quite a messy one. Manouch clearly is an experienced hot dog maker as he can cook up five dogs in less than one minute to keep the line going. The GW Sauce and Half Smoke Hot Dog are must haves. GW's very own celebrity is well worth a visit. I stumbled across your blog actually looking for info about Manouch. I went to GW from 2000-2004 and getting a half smoke with Chili and Cheese was always a must on fridays. Nice to know he is still at it!